Tis the season to be baptised. There were seven of them who were baptised at my church on Easter Sunday. We have heard about baptism – the reason for baptism, the modes for baptism, but what is that to you? yes you Faith Child? So many go to church every Sunday. 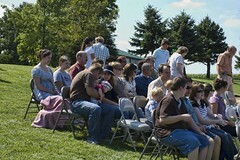 So many hear the Word every Sunday. So many say I am a Christian. But have you committed to your loving Heavenly Father? Has the inward work taken place in your life, and does it matter enough to you to want the whole world to know that YOU belong to HIM? When I am angry, do I say “I forgive you”? When I am to love – do I walk away? When I should be responsible for my commitment – do I sleep in? do I make someone do the work by default? do I forget about it? do I really love Him? Yes, it is not by works that we have done that He saved us – but by their fruit shall the enemy(enemies) of soul(s) know us. If you have not been baptised – how do you show the world that you belong to Him? How do you show to the world you mean what you say? How do you say what you believe is so important to you that you must die to self, you are raised in newness of life, because He lives, you can face tomorrow and you are looking forward to His soon return? Have you? are you His? Tell the devil you belong to Jesus and are serious about it! Today tell him right now! from your baptism date. Tell yourself you belong to Jesus for you have decided to follow Jesus and will not turn back from today! from today your baptism date. Have you strayed far from Him? Turn around and remember your baptism date. Turn! turn! turn! to Him and remember. Yes I have been baptised. I will follow Him. No, I have not been baptised and did not know what I missed and I want to be baptised so the whole world and the devil will know that I am committed to follow my Lord. ChristianBlessings10@gmail and let us help you find your way to commitment to Christ, the Truth, the Life and The Way, the only Commitment worthwhile. 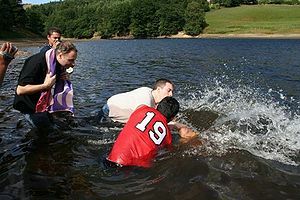 This entry was posted in A CLICK A BLESSING TODAY, CHRISTIAN LIFE AND THE WORD, CHRISTIAN TEENS BLOGS and tagged baptism, commitment, Devil, I am His, never turn back, self, tell the world, turn to God. Bookmark the permalink. One of the most powerful Sunday morning services we have had in our church here was a service of “Remembering Your Baptism”. What a refreshment there is in calling to mind the details of our Christian baptism. How every empowered we are to go forth in newness of life and walk out in love. In many countries with other beliefs, a person who claims to be a Christian might be tolerated by their families and society . . . UNTIL they are baptised. This act usually means the person is alienated from their family and is often persecuted and even killed for their faith. Yes, taking a stand in baptism tells the unsaved relatives, friends and family, that a person means business in following the Lord. It is usually a hurdle many first born sons who carry the duties of filial piety have to cross, when converted from other religions . It is at this point the world sees a separation from just a follower to being a disciple of the Lord. 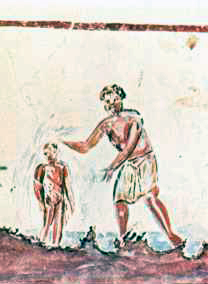 It is a frequent practice that at death bed conversions, the convert asks to be baptised by sprinkling to inform relatives without a shadow of doubt that it was a decision made by the individual and would entail Christian burial rites rather than heathen rites. The importance of our public testimony of receipt of salvation (baptism) is so overlooked by many. Just as you say… baptism not only declares we have been saved , but also declares to the wrold that we will live our lives for Him! Thanks for a great reminder! There are many who are unchurched and who do not follow after the Lord into the waters of baptism. Many of these are taught that just receiving Jesus as Saviour is enough to get by to get them to heaven. They are not taught that being baptised seals their commitment to the Lord and informs the world of their decision. Closet Christians would fall into this category as often they are ashamed to be called Christians and not stand up for the Lord. They are the ones who suffer for even to themselves they are not confident they are sold out to the Lord and the enemy takes advantage of this fact in condemnation. Salvation is a private thing but baptism is a public acknowledgement of what has happened inside. The witness and testimony of the individual is strengthened by this very sybolic act of dying to self under the waters of baptism and rising in newness of life.